Hi again and a very happy Friday to you! 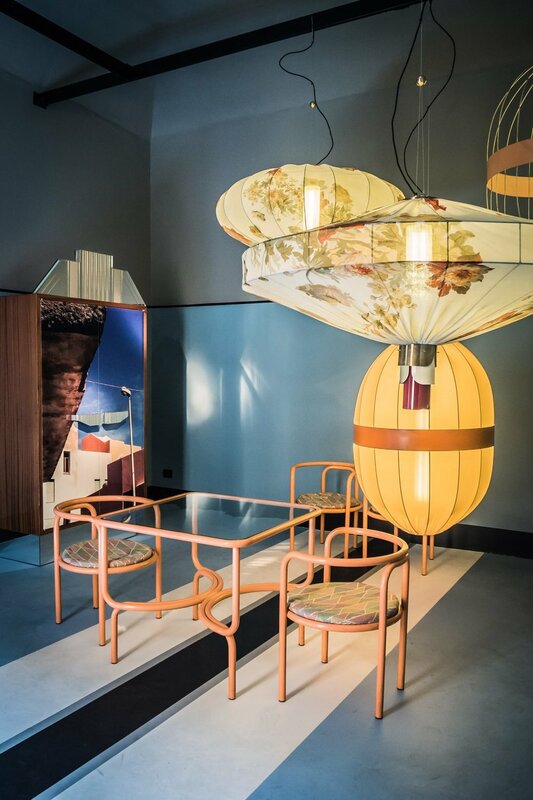 I simply must report in with more trends and highlights from Salone del Mobile and Milan Design Week. It was such a fantastic citywide explosion of design, I'll definitely return in 2018 for more of Milan. I was honored to collaborate with Kvadrat on this assignment as their eyes and ears to bring back trend reports for their global clients and customers - and now briefly, here in this post. My first visit to Bar Basso. I'll be going back. It made no sense but everyone who was anyone was there, so why not? Visiting the Rossana Orlandi Gallery and basking in the beauty of it all. I also liked seeing Ms. Orlandi herself sitting in the cafe surrounded by red tape so no one could cross over to meet her - made me giggle - reminded me of a crime scene. She's such a great woman, I'd like to have had a chance to tell her so. Eating lunch at Marta, next to Rossana Orlandi, because the vibe was right and food was delish. Eating with 13 amazing people, organized by Agata Dimmich, at Carlo e Camilla. That place was fantastic. the chefs are all trained under Carlo Cracco, an Italian chef and television personality. Just go and thank me later. The interior alone was worth it, the cocktails, the food... But make a reservation well in advance or you can forget getting in. My interview with Pavlo Schtakleff from Sé and later, running into him and his wife in downtown Milan (total coincidence) and his colleague and having dinner with them. What a gem this guy and his wife are and they have a three-year-old son like I do, so we had lots of funny stories to tell. I'll share Pavlo and his brand with you next week. My lunch with Amélie Du Passage from Petite Friture. I'll share her interview on decor8 next week. The DDN magazine blog tour, I wrote about it here. Hanging out with Sania Pell and Mark Wilson. Big, big highlight. Attending the Habitare and Aalto University School of Arts, Design and Architecture party, Nakuna. I got to see some great examples of design coming out of Finland and it was very interesting. Visited the IKEA festival -- I enjoyed seeing the styled rooms by Pella Hedeby and Anna Lenskog Belfrage and the many new products IKEA will have soon in-store - like a natural-color rattan cabinet that really stole the show for me. Eating a healthy lunch and recharging my phone at Re:Charge cafe from HumanScale in Brera -- And the excellent service. 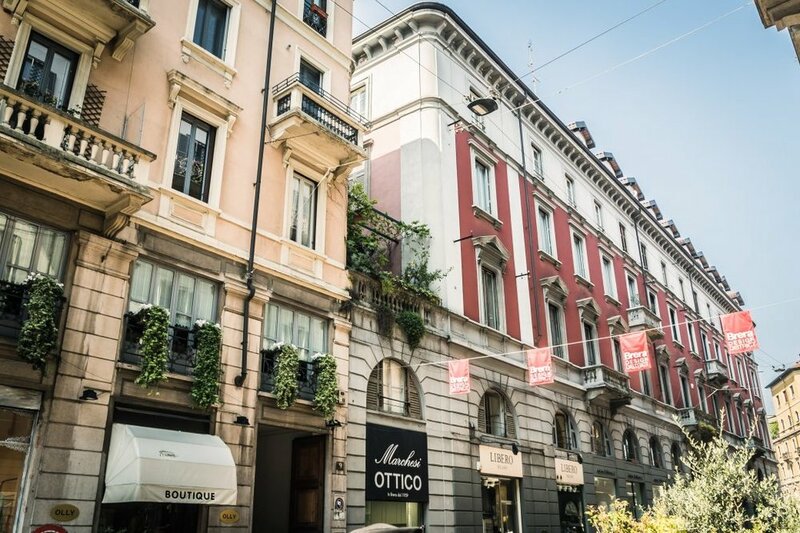 Seeing "The Visit" from Studio Pepe (I could have moved in right away), Apparatus Studio, Dimore Studio (magical unicorn experience, no lie) and Salvatori Home in Brera. All were huge highlights but Dimore was out of this world, I can't stop telling people about it. Noticing the great ceramics of MANI dotted around town. 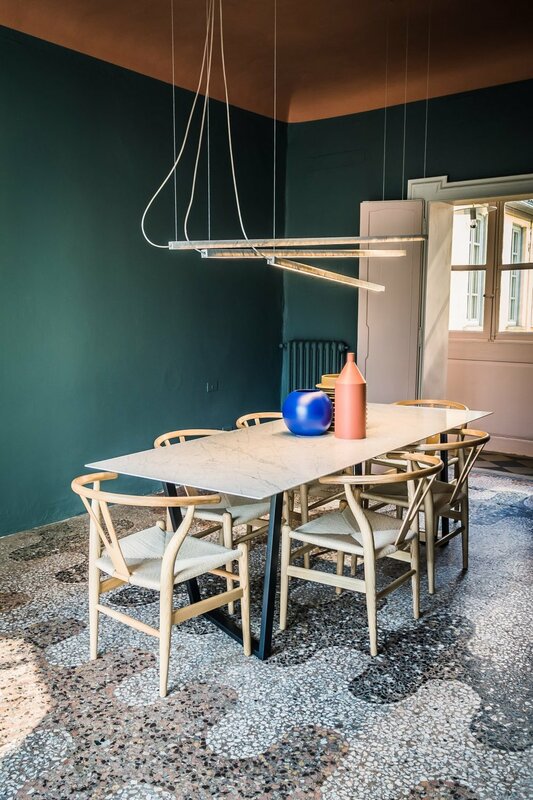 I first spotted her work at Ambiente in Frankfurt and felt they could be a real trend-piece, so seeing them around Milan was a real treat, especially when they were at some of the "it" spots. Spending time with Desiree, Agata and Anastasia. Seeing the interior design of Elisa Ossino at Salvatori Home. Learning about the wallpaper designs of Calico Wallpaper, a Brooklyn-based brand. Stunning and drool inducing. Experiencing the massive lighting stand, FLOS, at Salone del Mobile. Amazing. 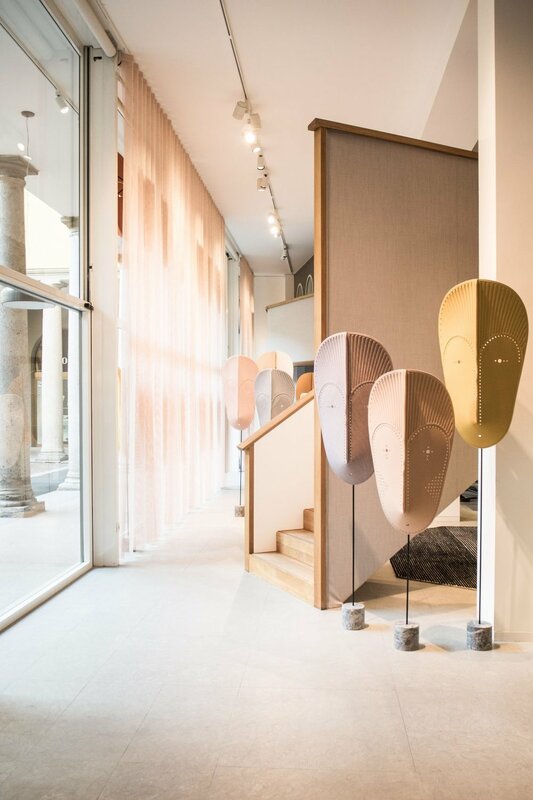 Checking out the gorgeous masks up close and personal, designed by GamFratesi, at the Kvadrat Milan showroom. Meeting the Editor of Casa Facile and seeing my good friend Anabella give a demonstration for them using MT Tape. I loved also meeting so many Italian bloggers at her event, they were so warm and sweet to me. A real joy! Seeing Florim's pastel tiles in their showroom. Learning about File Under Pop paints from Denmark. Finding the work of Germans Ermics. Love. Many thanks to Kvadrat and Kinnasand for this collaboration and for sending me to Milan.All opinions and photographs are my own. Please follow these brands who support me and my work on Instagram @kvadrattextiles and @kinnasand. Thank you.